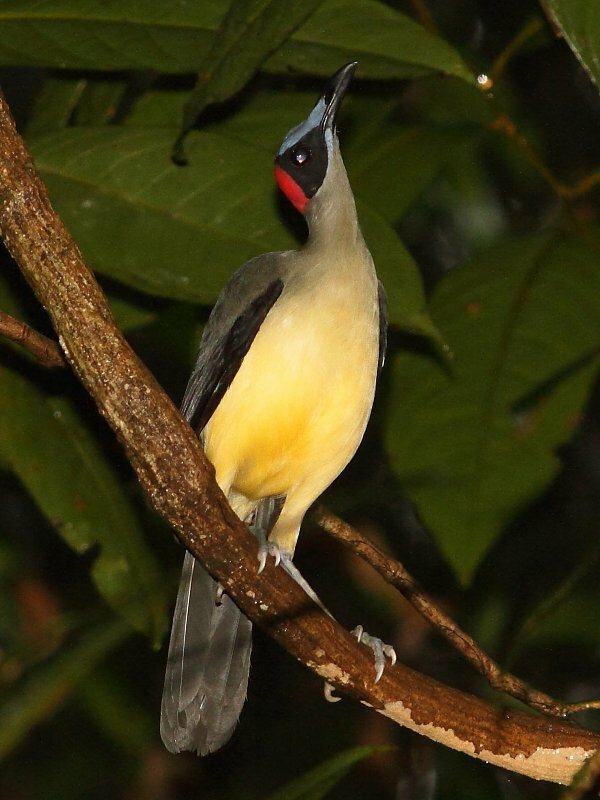 The family Picathartidae consists of two very unusual birds; White-necked or Yellow-headed Picathartes, endemic to the Upper Guinea forests of West Africa; and Gray-necked or Red-headed, restricted to Lower Guinea forests of Central Africa. Their strange appearance and habit of communally nesting in rock overhangs and caves has given them their alternative name of rockfowl, and before that the rather charming ‘Bald-headed Crow‘. Further illustrating their unusual long-tailed, yet crow-like demeanor and bright bald heads is the word ‘picathartes’ which translates as ‘magpie-vulture’! Despite initial appearances, these birds are in fact very large passerines (13-16 in) and research has shown them to be an ancient basal offshoot from the passerine evolutionary tree. They diverged at approximately the same time as the rockjumpers (two quite unique bird species endemic to Southern Africa and now in their own family), and as a result for a while were even placed in the same family. However this classification is no longer widely accepted, and in my opinion quite correctly so. They are also believed to be related to the Rail-Babbler of Tropical Asia. 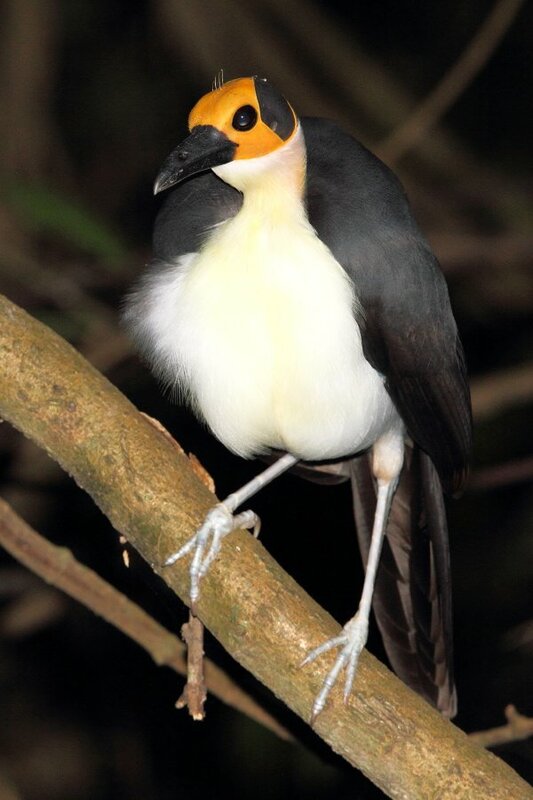 Picathartes have been a taxonomist’s nightmare indeed, having also been classified at one time or another as babblers, flycatchers, starlings, Old World warblers and crows. It has also been suggested that the picathartes may be the last survivors of a now extinct ancient bird order. 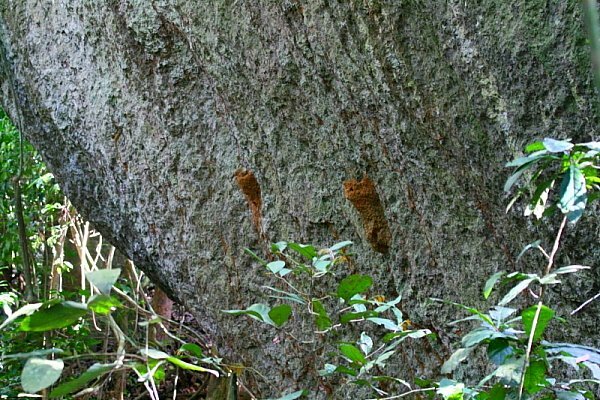 Both species occur in close-canopied primary and mature secondary rainforest, building cup-shaped mudnests attached to cave walls and rock overhangs, usually close to a steam in order to obtain building material. Their populations are highly fragmented as a result of these rather specific requirements. Forest cover in both species’ ranges is being destroyed at an unsustainable rate and these birds’ populations are dwindling. Both species of picathartes are threatened by extinction and categorized on the IUCN Red List as Vulnerable. This past December I visited Ghana specifically to search for White-necked Picathartes. Colonies of this most wanted bird had historically been recorded throughout the rainforest zone of Ghana, however relentless forest clearance resulted in all known populations being destroyed, and it was considered extinct in Ghana when I first visited ten years ago. Suspecting they still occurred, we went to considerable effort searching unsuccessfully for picathartes, our suspicions all but confirmed when several hunters I interviewed said they knew the bird and claimed they still existed. 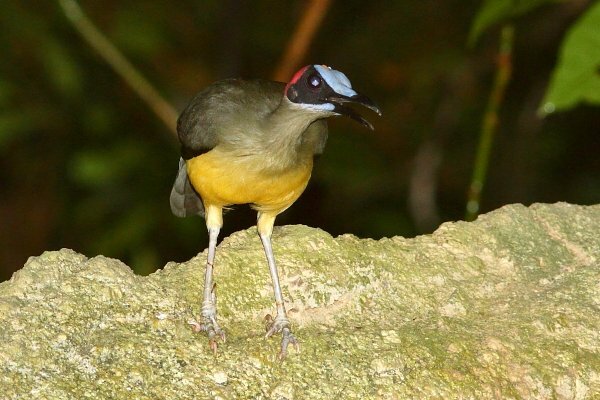 Then a few years ago the news broke that picathartes had been rediscovered in Ghana at a community forest reserve! Researchers explored surrounding areas and several more colonies were discovered (some of this research, including aerial surveys, was supported by funds from the Rockjumper Bird Conservation Fund). One of these colonies has now been opened to tourism after researchers studying the birds deemed visits by birders to be non-disruptive. So for this reason I found myself journeying to the remote village of Bonkro in the central region of Ghana. Here local hunters who had known about the colony and for generations had been harvesting the birds by simply picking the adults off their nests during the breeding season. Now that the colony is off limits for hunting, the population has grown and the village is benefitting tremendously from entry and guide fees, and a school is being built courtesy of conservation funds. We arrived in the afternoon and once we had met our local village guide and managed to escape the friendly throngs of children, we walked through fields of cocoa, corn and other crops. Vast tree stumps indicated these fields had recently been primary rainforest. Finally we slipped into the dark forest and followed a meandering trail for 2 miles, passing massive forest giants with expansive buttress roots, until we reached a very steep rise. After managing a sweaty climb of 400 feet or so, before us lay the colony of mud cup-shaped nests stuck against the walls of a rock overhand. We quietly arranged ourselves on a nearby rock and waited. Picathartes spend their days hopping and bounding along the forest floor and over mossy rocks and lianas, foraging for insects, snails and other prey. They also attend swarms of army ants to prey on insects they might flush. Very little is known of their behavior away from their nests as they are incredibly shy birds, disappearing at the first signs of disturbance. However, around their colonies (to which they usually return each evening) they seem to lose their fear, perching close to observers to preen, sometimes ignoring people and at other times displaying great curiosity. 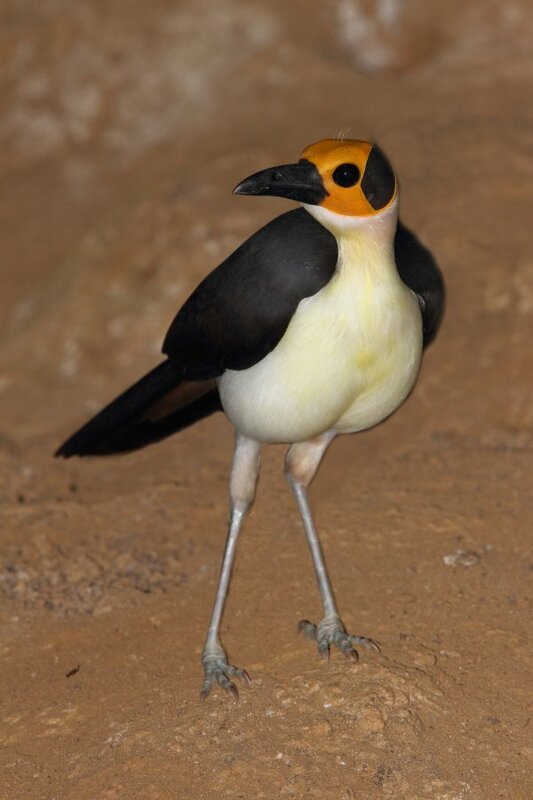 I was on my way to a White-necked colony in Ivory Coast in 2002 when a coup broke out and we had to reluctantly turn back, so finally seeing this bird was a dream come true for me, and what a show they gave us! 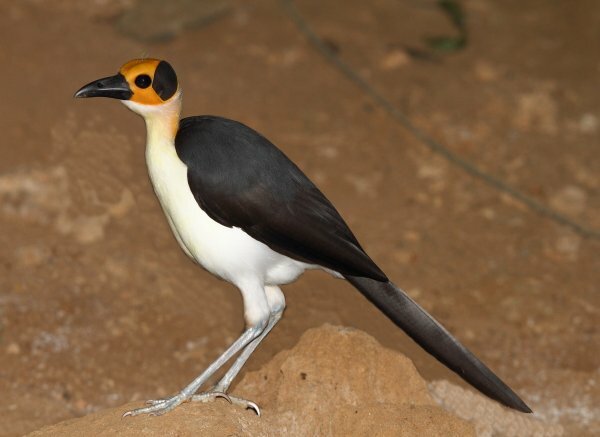 White-necked Picathartes may also be seen in Sierra Leone, even quite close to the capital Freetown. Here local people consider these birds the sacred guardians of their nesting rock formations (which are believed to house ancestral spirits), and have protected their colonies for generations. 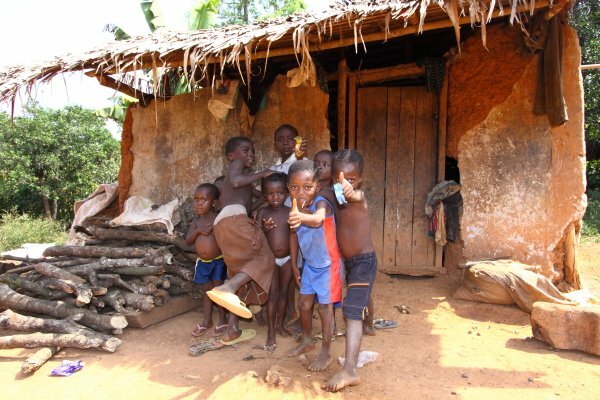 They also occur in Liberia, Ivory Coast and Guinea. Further to the south, the Gray-necked or Red-headed Picathartes has a wider range along the Gulf of Guinea. It occurs from south-west Nigeria, Equatorial Guinea (both mainland and on the island of Bioko), Cameroon and Gabon. It has recently also been discovered nesting in rainforests of the Sangha area of Central African Republic (CAR). Its ecology and behavior is much like that of its slightly larger cousin. I have only seen this species in the massive and beautiful Korup National Park in Cameroon. 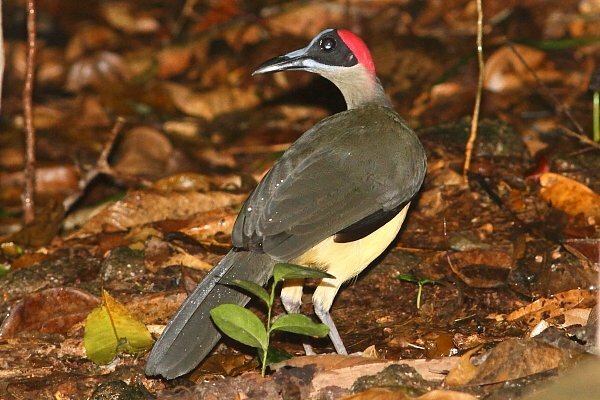 Reaching the site involves quite an ordeal, including driving or boating close to the Nigerian border, then crossing a massive swing bridge over the Mana River and hiking 6 miles to Picathartes Knoll, where a colony of these fabulous birds exist. Again, they are best seen in the late evening when they sometimes (but not always) return to roost close to their nests. From previous experience we have had an 11/12 success rate at this site, sometimes the views are fleeting and other times the birds provide a breathtaking show! Picathartes are obviously highly sough-after species for birders, not only because they are an essential tick for family listers, but they are really cool birds to observe. If you want to see either of them, I would say the most reliable and easily accessible site to tick a picathartes is Bonkro in Ghana, followed by the Western Peninsula Forest Reserve near Freetown in Sierra Leone. Both these countries are safe and English-speaking, with very friendly people. 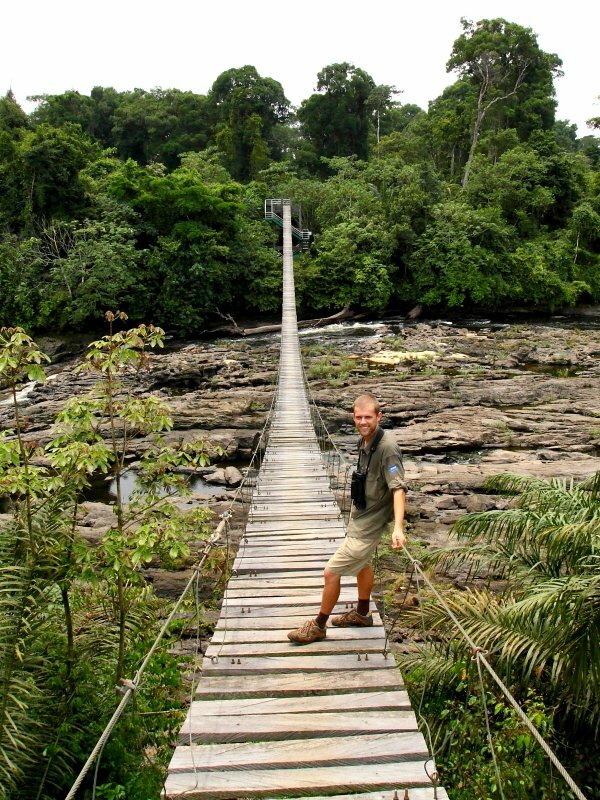 Ghana’s tourism infrastructure is far more developed than that of Sierra Leone and it is generally a more economical country in which to travel. If you would rather seek the somewhat less-reliable Red-headed Picathartes, Korup National Park is as good a site as any, although I do believe there are some very reliable sites in Nigeria, however navigating that difficult country might prove to be a nightmare not worth attempting. Sites in Gabon and CAR seem to be very seasonal and hit-and-miss, and Equatorial Guinea, like Nigeria, is not a recommended birding country. If your heart is set on seeing one of these bizarre birds, I can highly recommend venturing to the little-visited but fascinating corners of Africa where they survive. It’s guaranteed to be the trip of a lifetime! Picathartes also featured in David Attenborough’s television debut, on “Zoo Quest” back in the 1950s. WAOOO!!!! Great pictures of absolutely great birds! Awesome post of two of the coolest, most wanted birds on Earth. Real dream birds. Just visited Bonkro village & the Yellow-headed Picathartes cave in Ghana two weeks ago. A terrific experience. Thanks for the great comments everyone, picathartes really are cool birds, and well done John for visiting Bonkro and supporting the community conservation efforts there. This is a fabulous article; I’ve never even heard of these birds! How lovely that birds are finally important enough to bring people in…and get a school built in a small community! Awesome…and stunning photos, too! Thank you so much. I don’t travel, but I will forward your info to my friend…who does! Hi Beverly – I am very pleased that you enjoyed the article and thank you for your kind words! Also from rural KwaZulu Natal (Scottburgh) previously. Fantastic article & photos. Fascinating bird! Thanks.